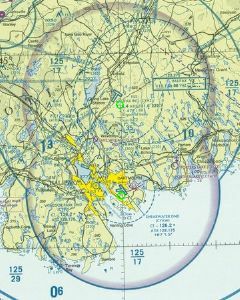 I love looking at aeronautical charts even if I have no idea what to do with them; I just think all the detail is neat. So it’s no surprise that I’ve been enjoying playing with the aeronautical charts collected online at Skyvector.com, which wraps them in a very usable AJAX interface that is reminiscent of Google Maps without simply being a Google Maps mashup: it scrolls and zooms fluidly. It uses real scans of paper maps; you can tell because sometimes you see the legends, etc., at the edges when you scroll. Via Cartography and La Cartoteca.